Toyota did have a pretty strong WRC presence in the 90's...until they got caught cheating. Cool to see them back in it now at least in some form. Subaru is very involved with global rallycross as well as rally here in the US. And privateer teams around the world. In competitive racing, everybody cheats one way or another, its just the ones that get caught who get penalised. Subaru never abandoned rallying (hence their ongoing support to privateers, global rallyx's and rally America), its just that the WRC changed its rules to encourage short wheelbase, small displacement turbo charged cars. Happy to see Toyota in the game either way. With Tommi Makinen heading up their effort and participating in a couple of divisions( bringing the 86 and the Yaris), they are looking pretty serious. There are some rumors that they are trying to bring Peter Solberg in as well as a Dakar effort. Yup, I was lucky enough to see the TRD ST205 WRC car when I was Yokohama last month on a visit to TRD HQ. Yeah, I guess if you go back to the pre-AWD rally days, that was the case. And Toyota did have good AWD rally cars too up until 99 when they dropped out. But still... I'm more surprised at Subaru focusing more on circuit. Of course, now a day, WRC class is such a stupid, boring formula, I can see why - 1.6L, limited technology, highly modified chassis not based on road version... it's like, what's the point? Well the really fun/crazy classes, GroupB, got eliminated because too many people died (both drivers and spectators). But yeah, it would be cool to see a bit more variety in WRC. That's why I love seeing cars like this GT86. Also why I love grassroots rallying. The array of cars you'll see at a Rally America event is awesome. I agree with everything except the first line. There's pushing the boundaries and maybe interpreting the rules differently, and then there's the turbo restrictor that they designed. Doesn't matter now though. That actually was more of it I think. They did get back to WRC with their badass Corollas for a few years after the cheating ban. But then they focused on F1 and also LeMans with the GT-One. Crap, I should have done that when I was there! My fiancee saw the picture on the front page and asked: "Why is that car painted like a luchador?" 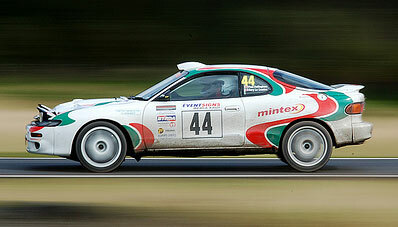 Would love to see an 86 with the old ST185 Celica's Castrol red and green rally design.